1.1.1 Roads D1, D8, D10 and the extended Road P2 in Tseung Kwan O New Town are necessary to provide an efficient means of district transport network, to connect the east Tseung Kwan O area via the town centre south to Tseung Kwan O Area 72. (Figure E1) These roads are proposed in order to meet the targeted population intake for the long term and to enable road link to Area 86 to be in operation for population intake. 1.1.2 Each of these roads is a Designated Project (DP) under Schedule 2 Part 1, A.1 of the EIAO. Under the EIAO, an EIA is a statutory requirement for Schedule 2 DP and an Environmental Permit (EP) must be obtained before any construction works may commence. 1.1.4 The nearby concurrent construction activities in between the construction period of Roads D1, D8, D10 and the extended Road P2 include site development of Areas 65, 67 and 86, and possible future development to the south of Road D1. Details of the concurrent construction activities have been taken into consideration in the construction phase impact assessment to assess the cumulative impacts. 1.1.5 In view of the speedy developments in Tseung Kwan O, this study has included a worst case scenario where possible future development to the south of Road D1 and at Area 78 is assumed. On such basis, year 2030 is used as the planning horizon. 1.1.6 Considering that there is possible future development to the south of Road D1, two assessments have been prepared to evaluate the noise, air quality, and landscape and visual impacts. 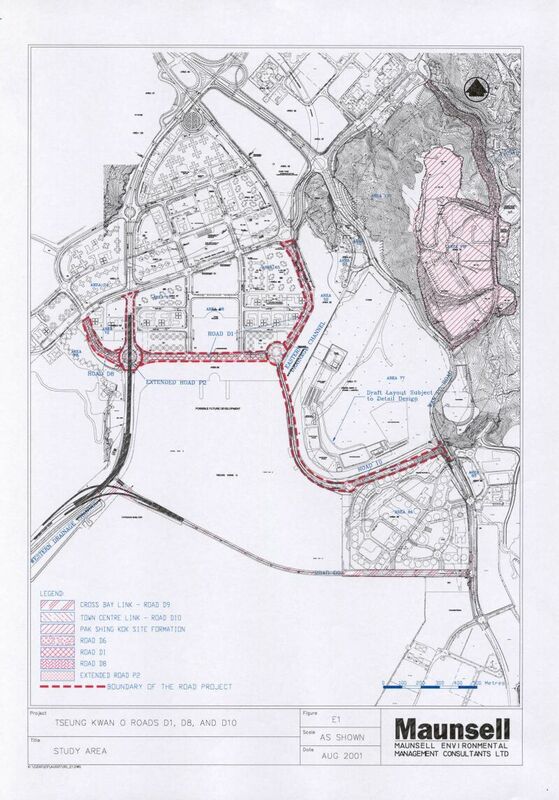 For Assessment 1, it is assumed that there will be further development to the south of Road D1, whereas Assessment 2 assumes that there will be no further development to the south of Road D1 based on the approved OZP. Assessment 1 and thus the proposed measures are for worst case assessment purpose, the package of the proposed measures will need to be reviewed if further reclamation is put forward in the future. 1.1.7 Construction of Roads D1, D8, D10 and the extended Road P2 needs to take into account the engineering feasibility and the environmental acceptability. Based on the development works packages and programmes, the potential environmental impacts arising from the development proposals have been assessed and the major conclusions and recommended mitigation measures are summarized in the following sections. 1.2.1 Cumulative construction dust impacts have been assessed taking into the concurrent construction activities in close proximity to the present project for the worst-case scenario. Model calculations have shown that dust concentrations at the nearby sensitive receivers are expected to exceed the EIAO-TM Dust Criteria and the Air Quality Objectives with respect to TSP. Watering the construction site twice a day together with strict implementation of other dust suppression measures as stipulated in the Air Pollution Control (Construction Dust) Regulation are recommended to reduce the dust nuisance. Good site practices and a comprehensive dust monitoring and audit are also recommended. It is anticipated that the Dust Criteria and Air Quality Objectives can be achieved by the implementation of these dust suppression measures and no adverse residual impact is expected. 1.2.2 During operational phase, since the proposed noise mitigation measures under the assumptions of the two assessments are different, air quality impact for the two assessments was studied accordingly. 1.2.3 In both Assessments 1 and 2, model results indicated that exceedance of 1-hour average NO2, 24-hour average NO2 and 24-hour average RSP concentrations as specified in the Air Quality Objectives is not expected at any representative air sensitive receivers. Thus, mitigation measures are not considered necessary. 1.2.4 For the air quality inside the proposed two sections of the deckover for Assessment 1, results of the air quality modelling show full compliance of relevant air quality standards hence adverse air quality impact is not expected. 1.3.1 Noise assessment was carried out with respect to all construction works of Extended Road P2, Roads D1 and D8. No assessment for construction of Road D10 was undertaken as there was no existing NSR identified near Road D10 during the construction phase. Representative NSRs located in close proximity to the proposed works were identified, taking into account the construction period of the work packages of the project and other concurrent construction activities nearby the NSRs. 1.3.2 Predicted unmitigated noise levels at most NSRs would exceed the construction noise standard stipulated in EIAO-TM. However, with the implementation of using quieter plant, installation of movable noise barriers and limiting the number of some PMEs, the mitigated noise levels at all NSRs would be in compliance with statutory criteria. No adverse residual impacts is expected. 1.3.3 Traffic noise from Road D1, D8, D10 and Extended Road P2 would give rise to adverse traffic noise impacts to the nearby NSRs. Deckovers (for Assessment 1) / semi-enclosures (for Assessment 2), cantilevered barriers and vertical barriers were proposed at-source, as far as practical, to alleviate noise impacts on the affected NSRs. Low noise surfacing was assumed at the elevated section of Road P2 where the speed limit is 70 km/hr. With the implementation of the proposed noise barriers, the noise levels at most of the NSRs would comply with the traffic noise criteria. For those NSRs which overall exceedance of 70dB(A) is predicted, noise contributions from the proposed new roads are less than 1.0dB hence no further noise mitigation measures are recommended. or noise sources from road junctions and roundabout, where noise barriers are infeasible. Detailed NIW Studies for the affected façades at residential buildings in Area 72 is recommended to determine the exact extent of indirect mitigation measures. Indirect technical remedies in the form of acoustic insulation and air conditioning have been recommended to some NSRs at planned schools which full compliance of noise standard cannot be achieved even when all practicable at-source noise mitigation measures is exhausted. Residual impacts in future development to the south of Road D1 should be reviewed based on the planned use of that area and the layout available then. 1.4.1 The identified potential sources of water quality impact include construction runoff and drainage; debris, refuse and liquid spillages from general construction activities; and sewage effluent from the construction workforce. Minimisation of water quality deterioration can be achieved through implementing adequate mitigation measures, such as control measures to minimise construction run-off and drainage from the site. With the implementation of the recommended mitigation measures, the construction works are not expected to result in any unacceptable impacts on marine water quality. 1.4.2 During construction of Road D10 adjacent to the TKO Stage 1 landfill at Area 77, the discharge of groundwater pumped out during foundation works will not be permitted to be directly discharged into the nearby drainage channel or coastal waters will not be permitted. It is recommended that the groundwater be stored temporarily on site as the volume is anticipated to be small. An identified option for the treatment and disposal of the collected groundwater is tankering of the groundwater to the TKO Preliminary Treatment Works (PTW) at Area 85. Pre-treatment of the collected groundwater may be required to meet the Technical Memorandum on Effluent Discharge Standards prior to the groundwater being discharged to the TKO PTW. On-site pre-treatment of the collected groundwater, if required, should be implemented to the satisfaction of the Director of Environmental Protection prior to its discharge to the TKO PTW. The pile supports for the elevated section of Road D10 would not form a barrier to leachate seepage and thus it is expected that there would not be any significant change to the leachate migration profile at the landfill. 1.4.3 The only source of potential water quality impact during the operation phase will be runoff from the road surfaces. A surface water drainage system with adequate grit interceptors will be provided to collect the road runoff. 1.4.4 Assessments have shown that the placement of Road D10 bridge piers in the Eastern Drainage channel is unlikely to result in significant reduction in flushing capacity of the channel. 1.5.1 Wastes generated by the construction works are likely to include construction and demolition material, excavated material, workforce wastes and chemical waste. Provided that the identified waste arisings are handled, transported and disposed of using approved methods and that the recommended mitigation measures are adhered to, adverse environmental impacts would not be expected during the construction phase. The recommended reuse and disposal arrangements shall form the basis of the site Waste Management Plan to be developed by the Contractor at the commencement of the construction phasedetailed design stage. 1.5.2 The operation of the proposed Roads D1, D8, D10 and the extended Road P2 will generate wastes associated with littering and road maintenance activities. The potential environmental impacts arising from the handling and disposal of these wastes is anticipated to be insignificant. 1.6.1 Comprehensive restoration works for TKO Stage I Landfill (TKO Stage I) have been completed. A comprehensive monthly monitoring programme also commenced in 1997. Although the methane levels recorded from July 2000 to July 2001 at the monitoring wells located near the boundary of TKO Stage I are very low, significant levels (> 5%) of carbon dioxide were recorded in some wells. As such, the source of LFG at TKO Stage I is considered major. 1.6.2 There are no known lateral fault lines between TKO Stage I and Road D10, and no existing utilities directly linking the landfill and Road D10. Therefore, there is a higher possibility for potential LFG migration to Road D10. Road D1 will be on reclaimed land and the Eastern Drainage Channel situated between Road D1 and landfill will act as a barrier of LFG migration to Road D1. There are no existing utilities directly linking the landfill and Road D1. As such, the possibility for potential LFG migration to Road D1 is lower. 1.6.3 The common targets of LFG migration at both Road D1 and Road D10 are temporary excavations during the construction phase and confined space (e.g. utility manholes, inspection chambers or ducts) during the operational phase. Since these areas are not accessible to public and restricted to trained personnel, the risk level of these targets are considered to be medium. 1.6.4 The risk level for all the individual targets at the concerned section of Road D1 and Road D10 is medium. The overall risk level for the concerned section of Road D1 and Road D10 is high. As suggested in the EPD’s Landfill Gas Hazard Assessment Guidance Note, some engineering and detection measures should be provided to safeguard these road sections. · Prior to and during development or construction, utility companies would be advised of the possible presence of LFG in the subsurface for them to take into account in the design, construction and maintenance of their works. · Void around any service ducts, pipes or cables etc. within conduits would be filled with gas resistant mastic. All ducts, manholes, and chambers, either specific to the proposed developments or to utility services shall be sealed off from the ground to prevent gas entry and provided with vented covers to allow any gas that enters to dissipate harmlessly to atmosphere. · During site formation and construction works, portable gas detectors should be used to regularly check the LFG level in depressions, trenches, and other excavations. The monitoring shall be undertaken at the beginning of each half working day (i.e. morning and afternoon) for the entire period the excavation remains open. If high LFG level is measured, ventilation of such excavations should take place and sources of ignition should be kept away from areas where build-up of gas is possible. 1.6.6 The following monitoring requirements are recommended: (i) Atmosphere within utility manholes or chambers should be checked for methane, carbon dioxide, and oxygen prior to entry. The pre-entry monitoring shall be undertaken, where applicable, in accordance with the requirements of the Factories and Industrial Undertaking (Confined Spaces) Regulation; (ii) Routine monitoring should be conducted at the manholes and chambers on a regular basis. The frequency of the routine monitoring is recommended to be biweekly during the initial stage (the first 3 months of the operational phase). The frequency shall be subsequently reviewed on a quarterly basis through discussion with EPD, based on all the available monitoring data for methane, carbon dioxide and oxygen (including that of pre-entry monitoring). 1.7.1 An assessment of the Landscape and Visual Impacts during the Construction and Operational Phases of the construction of Roads P2, D1, D8 and D10 has been undertaken. Potential landscape and visual impacts have been identified. A prediction of their magnitude and potential significance before and after the implementation of mitigation measures has been undertaken and a prediction of their overall acceptability, or otherwise has been made, according to the criteria in Annex 10 of the EIAOTM. It should be noted that the further reclamation scenario and associated mitigation measures proposed are just for the Worst Case Scenario assessment purpose – the package of proposed measures would need to be reviewed if the further reclamation was put forward in future. 1.7.2 Extensive landscape and visual mitigation measures will be undertaken during both the construction and operation phases and these are detailed in chapter 8 of the EIA report. The operation phase mitigation measures are principally centred on sensitive aesthetic design of all road-related structures and noise mitigation structures, attractive hard landscape detailing, and extensive tree and shrub planting in the roadside amenity areas. 1.7.3 All landscape mitigation measures indicated in this report will be included in the works boundaries and the landscape and visual mitigation measures implemented within these areas are therefore considered to be “on-site”. 1.7.4 Construction Phase landscape and visual impacts would be as described for Assessment 2 below, except that if the deckovers over Road D1 are constructed separately, after the completion of the other roadworks and amenity strips, then this would result in some additional adverse construction impacts, comprising adverse impacts of substantial significance on the future pedestrians and cyclists on Road D1 (T6), users of open space in Area 66 (O5), residents in the planned developments in Areas 65 (R6) & 67 (R7); and impacts of moderate significance upon the future trees and shrubs in the planned amenity areas along Road D1. However, these additional impacts would be avoided if the deckovers are constructed at the same time as the other roadworks. 1.7.5 No physical landscape resources would be impacted. Residual landscape impacts would be minor and would be limited to adverse impacts of moderate significance to the quality of landscape character in Area 77 landfill and slight significance to the quality of the landscape character of the Eastern Drainage Channel. 1.7.6 Residual visual impacts during the construction phase would also be relatively minor and would comprise mainly adverse impacts of moderate significance upon residents in the residential development in Area 51 and occupants and users of the commercial/residential development in Area 72. All other visual impacts are slight or insubstantial. 1.7.7 Residual landscape impacts in the Operation Phase would be minor and as described for Assessment 2 below, except that if the deckovers on Road D1 are built at a later stage than the other roadworks, then this would result in adverse impacts of slight significance on the future trees and shrubs in the planned amenity areas along Road D1. However, these additional impacts would be avoided if the deckovers are constructed at the same time as the other roadworks. 1.7.8 The principal residual visual impacts in the Operation Phase would be adverse impacts of substantial significance caused by deckovers over Road D1 upon pedestrians and cyclists adjacent to road D1 (east-west section) (T6). On the other hand, the deckovers would tend to reduce long term visual impacts upon VSRs looking down from adjacent residential properties in areas 65 and 67. 1.7.9 Some residual adverse visual impacts of moderate significance, caused principally by noise barriers and/or elevated road structures, would be felt VSRs located immediately adjacent to the roads, mainly pedestrians, cyclists and users of adjacent open spaces. All other residual impacts are assessed as slightly adverse or insubstantial. 1.7.10 Residual landscape impacts would be very minor and would only comprise adverse impacts of slight significance to the landscape character of TKO New Reclamation Area, Area 77 landfill, Area 86 Dream City and the Eastern Drainage Channel. 1.7.11 Residual visual impacts would essentially be the same as for Assessment 1, with the exception that VSR's in the possible future commercial and residential development on an extended reclamation would not exist, and there would be slightly less, although still substantial, adverse impacts on pedestrians and cyclists on Road D1 (east-west section) next to Areas 65 and 67. The substantial significance of these impacts would be due to the semi-enclosures over road D1 adjacent to Areas 65 and 67, which would be visually prominent. However, these impacts would be less than those caused by the deckovers in Assessment 1, as they would be partially mitigated by good aesthetic design of the structures and attractive tree and shrub planting in roadside amenity areas. 1.7.12 In general terms, the residual landscape impacts are relatively minor and can be successfully mitigated. The most significant residual visual impacts will be felt by VSRs located immediately adjacent to the roads (i.e. pedestrians, cyclists and users of adjacent open spaces) and will result from the visual prominence of the noise barriers, semi-enclosures (in Assessment 2) and deckovers (in Assessment 1). Most of these visual impacts can be largely mitigated by good aesthetic design of the structures themselves and by attractive and extensive tree and shrub planting in the roadside amenity areas. 1.7.13 The only substantial adverse residual impacts that would remain after mitigation are the visual impacts identified on pedestrians and cyclists in road D1 who will pass alongside and underneath the semi-enclosures (in Assessment 2) and deckovers (in Assessment 1), and it is considered that because these impacts are limited to one group of receivers who are relatively transient (as they pass along the road), they do not justify a conclusion that the overall impacts are unacceptable. 1.7.14 Therefore it is considered that, in the terms of Annex 10 of the EIAO TM, the landscape and visual impacts are acceptable with mitigation measures for both Assessment 1 and Assessment 2. ·Regular checks shall be carried out to ensure that the work site boundaries are not transgressed, hoardings are properly maintained and that no damage is being caused to the surrounding areas (CM1). Any irregularities shall be brought to the attention of the appropriate adjacent management and maintenance agencies (e.g. private land owner, or HyD, LCSD, or AFCD, or HKHA etc.). Remedial measures shall be designed and implemented as appropriate. ·Erection of decorative screen hoarding particularly in areas adjacent to existing developments (CM2). (Hoardings next to undeveloped areas / construction sites need not be decorative). ·Storage of materials and plant shall be limited to areas less visible to receivers (CM3). ·Control of night-time lighting to prevent upward glare to visually sensitive receivers. Lighting should be directed to where it is required for security purposes only (or night working if permitted) (CM4). ·Potential conflicts between landscape works and other works shall be avoided. Utilities works in particular shall be checked to ensure that they do not compromise landscape and visual mitigation measures. Where potential conflicts occur, engineering and utility layouts shall wherever possible be redesigned to avoid conflicts (CM5). ·For construction works associated with the deckovers proposed in Assessment 1 - Worst Case Scenario, minimise construction impacts on trees and shrubs located along Road D1, and transplant any trees that will be affected by deckovers (CM6). ·Aesthetic design of elevated structures on Roads P2 and D10 with particular regard to form and finishes so as to create as slender and elegant an appearance as possible. ACABAS approval shall be required (OM1). ·In the Worst Case Scenario, the two full deckovers over Road D1 adjacent to areas 65 and 67 shall be designed as landscape decks. Structural design of the deck shall allow for adequate soil depth to permit tree planting (1.5m min). The appropriate maintenance agencies shall be involved in the approval of the design of the deckover. ·Attractive design of pedestrian footbridges and subways including murals. ACABAS approval shall be required (OM10). 1.1.1TDD has not yet identified the works boundaries. For the purposes of the assessment it is assumed that all designated amenity strips alongside the roads are included in the works boundaries and that landscape and visual mitigation measures implemented within these amenity strips are therefore “on-site”. There are no mitigation measures proposed beyond the extent of the designated amenity areas. 1.1.1Residual landscape impacts would be as described for Assessment 2 below, except that there would be additional impacts associated with the construction of the noise mitigation measures on Road D1, which would result in an adverse impact of substantial significance on the landscape character of the Road D1 corridor (LCA7), and the future trees and shrubs in the planned amenity areas along Road D1 (LR1). 1.1.1Residual visual impacts would be as described for Assessment 2 below, except that there would be additional impacts associated with the construction of the noise mitigation measures on Road D1, which would result in adverse impacts of substantial significance on the future pedestrians and cyclists on Road D1 (T6); users of open space in Area 66 (O5); and residents in the planned developments in Areas 65 (R6) and 67 (R7). 1.1.1No physical landscape resources would be impacted. Residual landscape impacts would comprise adverse impacts of moderate significance to the quality of landscape character area LCA8 – Area 77 landfill and slight significance to the quality of landscape character area LCA12 – Eastern Drainage Channel. 1.1.1Residual visual impacts during the construction phase would comprise adverse impacts of moderate significance upon residents in the residential development in Area 51 (R1) and occupants and users of the commercial/residential development in Area 72 (C/R1); and adverse impacts of slight significance users of the landfill in Area 77 (O1); walkers in the upland areas (O2); residents in Area 74 (R4); occupants of the commercial/residential development in Area 56 (C/R2); workers in the industrial estate in Area 85 (I2); users of the G/IC development in Area 56 (G/IC1); and travellers on Tseung Kwan O Bay (S1), the road from Cheung Leung Tin to Tai Wan San Tsuen (T1), and Wan Po Road (T2). 1.1.1The operation phase residual landscape impacts would be as for Assessment 2 below, except that the deckovers on Road D1 would result in adverse impacts of substantial significance on the landscape character of the Road D1 corridor (LCA7) and the future trees and shrubs in the planned amenity areas along Road D1 (LR1). 1.1.1Operation phase residual visual impacts would include adverse impacts of substantial significance upon pedestrians and cyclists adjacent to road D1 (east-west section) and roundabouts (T6). The substantial significance of these impacts would be due principally to the nature of the full deckovers over road D1 adjacent to Areas 65 and 67, which would be very visually overpowering and prevent tree planting and soft landscape treatment underneath the decks. The total area under the decks, including road area, would be approximately 1.8ha. 1.1.1Residual adverse impacts of moderate significance, caused principally by noise barriers and/or elevated road structures, would be felt by pedestrians and cyclists adjacent to extended road P2 (T5); pedestrians and cyclists adjacent to road D1 (north-south section) (T7); pedestrians and cyclists adjacent to road D8 (T8); pedestrians and cyclists adjacent to road D10 (T9); users of the open space adjacent to road D8 (O4); users of the open space adjacent to road D1 in Areas 66 (O5); and users of the open space adjacent to road D1 adjacent to the Eastern Drainage Channel (O6). 1.1.1Residual adverse impacts of slight significance would be felt by users of the restored landfill in Area 77 (O1); occupants and users of the commercial/residential developments in Area 72 (C/R1), Area 74, (C/R4), Area 56 (C/R5), Area 86 (C/R6) and the possible future development south in the extended reclamation south of Road D1 (C/R7); and residents in the residential developments in Area 51 (R1), Area 65 (R6), and Area 67 (R7). 1.1.1Residual landscape impacts would comprise adverse impacts of slight significance to the landscape character of landscape character areas LCA7 – TKO New Reclamation Area, LCA8 – Area 77 landfill, LCA10 – Area 86 Dream City and LCA12 – Eastern Drainage Channel. 1.1.1Residual visual impacts would essentially be the same as for Assessment 1, with the exception that VSR C/R7 would not exist, and there would be slightly less, although still substantial, negative impacts on VSR T6 (pedestrians adjacent to road D1 (east-west section) next to Areas 65 and 67) due to the fact that there would not be full deckovers spanning the road as there would be in the Worst Case Scenario. Instead of the deckovers there would be a semi-enclosures adjacent to Areas 65 and 67. These structures would still create substantial negative impacts on pedestrians and cyclists, even after mitigation. 1.1.1Overall, it is considered that, in the terms of Annex 10 of the EIAO TM, the landscape and visual impacts are acceptable with mitigation measures for both Assessment 1 and Assessment 2..
1.8.1 Environmental monitoring and audit (EM&A) requirements have been specified in an EM&A Manual. The requirements and principles in preparing the EM&A Manual have been briefly outlined in the EIA report. The Manual has been prepared with reference to the EIAO-TM and EPD’s Generic EM&A Manual. The EM&A Manual contains full details of proposed baseline and compliance monitoring programmes, as well as performance specifications, audit requirements and procedures for air quality, noise, landfill gas monitoring, waste management, water quality, landscape and visual. 1.9.1 The proposed Roads D1, D8, D10 and the extended Road P2 in Tseung Kwan O New Town will provide an efficient means of district transport network connecting the east TKO area via the town centre south to TKO Area 72 and also enabling road link to Area 86. The proposed project is necessary to facilitate the rapid developments in TKO and the target population intake. · Existing air sensitive receivers in the TKO New Town will be protected from cumulative construction dust impact by the recommended dust control measures during the construction phase. · No adverse air quality impacts were predicted during the operational phase at existing and planned air sensitive receivers in the TKO New Town. · Existing noise sensitive receivers in the TKO New Town will be protected from adverse noise impact during the construction phase by adopting quiet plant, installation of movable noise barriers and limiting the number of some PMEs. · Adverse traffic noise impact to existing and planned noise sensitive receivers will be ameliorated by the proposed mitigation measures including deckovers (for Assessment 1)/semi-enclosures (for Assessment 2), cantilevered barriers, vertical barriers and low noise road surface where applicable. Indirect technical remedies have also been recommended to some NSRs at planned schools which full compliance of noise standard cannot be achieved even when all practicable at-source noise mitigation measures are exhausted. · Adverse water quality impact during the construction phase will be prevented by adopting the recommended mitigation measures such as minimising construction run-off and drainage from the site, and also on-site pre-treatment of groundwater prior to disposal. · Operational phase water quality impact would be insignificant and it has been recommended that grit interceptors be provided to collect road runoff. · Environmental impacts due to waste generation during the construction phase would be avoided by the development of a Waste Management Plan. The potential impacts arising from operational waste generation is anticipated to be insignificant. · The hazards of landfill gas at concerned road sections have been assessed and the common risk would be associated to confined spaces and temporary excavations. For the construction phase, engineering and detection measures have been recommended. For the operational phase, regular monitoring of LFG has been recommended. · The landscape and visual impacts for both Assessments 1 and 2 have been assessed and are acceptable with the recommended mitigation measures. 1.10.1 The EIA of Roads D1, D8, D10 and the extended Road P2 has identified potential environmental impacts of various nature including water quality, air quality, noise, waste management, landfill gas hazard, and landscape and visual impacts. The potential environmental impacts are expected to arise during both construction and operational stages. 1.10.2 The results of the EIA indicate that the environmental impacts identified are generally within acceptable environmental standards. Where exceedances of environmental standards are observed, appropriate mitigation measures have been recommended to meet the acceptable environmental standards and significant residual impacts after mitigation are not expected. Environmental Monitoring and Audit requirements have also been specified in an EM&A manual to ensure proper implementation of the recommended mitigation measures.